Theodore A. Lesko, 101, passed away peacefully with family in Pennington, NJ on December 14th. He spent most of his adult life in Abington, Pa.
Ted was the beloved husband of Jean H. Lesko, who died in December 2015, for over 70 years. Born in Clairton, Pa. he was the son of John F. Lesko and Mary V. Lesko and had four brothers, all of whom are deceased. He was a graduate of Pennsylvania State University with a degree in Science. While at Penn State he played on the tennis team and was manager of the gymnastic team. He also was a member of Kappa Sigma Fraternity. He was employed by DuPont during World War II in the high explosives division and then joined Rohm and Haas Co. where he had various assignments over the next 47 years including Safety Director, production manager and marketing administration. 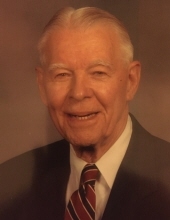 Ted was a member of Abington Presbyterian Church for over 65 years and was active in community affairs, serving as president of the Abington Junior High School PTA and a founding member of the Abington Community Association. His last 2+ years were spent at Brandwine Senior Living in Pennington, NJ. He enjoyed his time there and made many new friends.. He belonged to Manufacturers Golf and Country Club and enjoyed playing duplicate bridge. He was also a big fan of Penn State football. He is survived by three children, Deborah (Lamar) Underwood of Pennington, N.J., Theodore D. of Saddle Brook, N.J. and James (Mary Lee) of New Canaan, CT., four grandchildren, and seven great grandchildren. Memorial Service will be celebrated 11:00AM Saturday, January 5, 2019, at the Blackwell Memorial Home, 21 N. Main St. Pennington, NJ 08534. Donations in his memory may be made to Abington Presbyterian Church, 1082 Old York Road, Abington, Pa., 19001. To send flowers or a remembrance gift to the family of Theodore A Lesko, please visit our Tribute Store. "Email Address" would like to share the life celebration of Theodore A Lesko. Click on the "link" to go to share a favorite memory or leave a condolence message for the family.